What the heck happened to the saying “April showers bring May flowers?” Apparently this year the rain happened in February, the flowers in March, and now we are facing a summer drought in April! In fact, February 29 was the last time we had a good soaking rain that totaled 1.44 inches. Since then we have only had two moderate rains. So are we really in a drought? 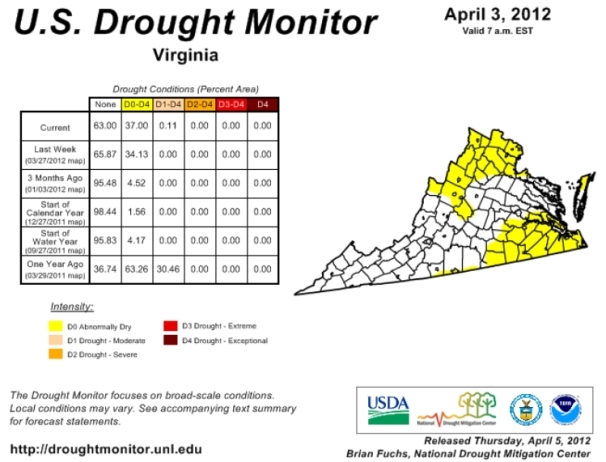 Actually, while we have had significanlty less precipitation this year, according to the U.S. Drought Monitor much of Maryland, Northern Virginia and Southeast Virginia are “Abnormally Dry.” So while we are dry we are not YET in a drought. Lawn needs about one inch of water per week (including precipitation). Use a can or rain gauge to determine the amount of water applied by sprinkler system and rainfall. Apply water only when needed. Too much water can cause diseases. One simple test to determine if lawn needs water is to walk on the lawn. If you leave footprints, it is time to water. Water in the early morning (4 a.m. to 8 a.m.). Do not water during midday hours when it is hot and sunny to avoid scalding the turf. Do not water at night because the lawn stays wet for a long period which can promote diseases. If you have a sprinkler system, set the system to turn on for three 10 minute sessions with each session 1/2 hour apart to improve water infiltration and reduce runoff. In addition, you will want to make sure your plants are receiving enough water. 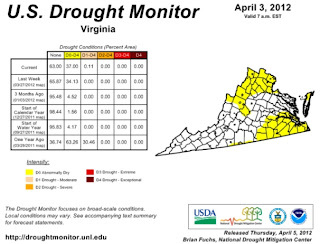 Ths dry weather comes at a time when your plants are using more energy than any other time of year. Flowering and opening new leaves takes a lot out of your plants, especially those plants that are under a year old. Soil around the edge of root balls should be moist 3-4 inches deep. You can check this with your finger. If soil is moist, hold off on watering. If soil is dry, water thoroughly. Infrequent deep watering is preferable to frequent shallow watering. With larger trees and shrubs you should check every 2-3 days. With smaller shrubs and perennials, which are grown in lighter soil mixtures with a lower water holding capacity, check the moisture content every 1-2 days.